One of the wonderful things about working in a team ministry is sharing in the prayer lives of the other members. The best way to stay informed of requests is to meet for prayer with your team on a regular basis. But that is not always possible if your team is not in the same location. A personal prayer list is not something that you can always post to your website because of the need to keep some things private. Here is one solution using Google Docs. 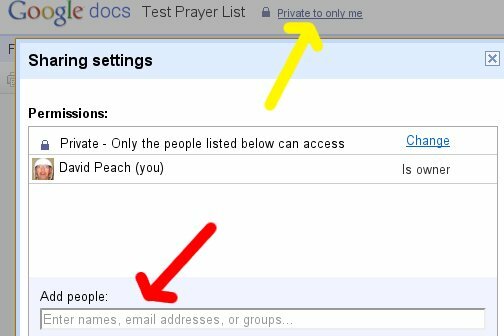 After creating your Google Docs prayer list you will see that the permissions are set to Private to only me (yellow arrow in the picture). You can click on that link and it will pop up the Sharing Settings dialog which allows you to input the email addresses of the friends you want to share the document with (indicated by the red arrow). When you put someone’s email address in that field it will let you choose whether the person can only read or also edit the document. They will be informed of the invitation through the email address you provide. Your co-workers do not need to have a Gmail address to be able to use Google Docs. However, they will need a Google account. They can create the account using their current address so that they do not have to use Gmail. Some people have privacy concerns about using Google’s services. 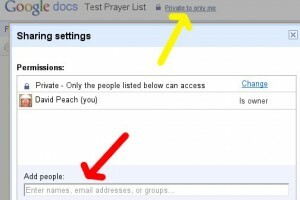 While you may not want to keep corporate secrets on a web server, you can easily share enough information with your prayer partners so that they will know how to pray for the team’s needs. Would privacy/safety issues for international missionaries in hostile countries preclude using this electronic format in google docs? I think it is a good question. You should be wise when writing down anything connected to the Internet. I guess it comes down to a matter of how much you trust the tools. Right now I still trust this. I’m not sure it will always be trustworthy. In either case, I would not put too many personally identifying details into any online prayer list.